“Shall We Dance?” (Shall we ダンス? ), the 1996 film that won 14 Japan Academy Prizes (Japan’s national equivalent of the Oscars), was famously remade into a flick eight years later starring Richard Gere and Jennifer Lopez. Long before post-production of the latter version began, there were grumblings that it was a travesty to think that a Westernized version could equal the original, let alone top it. The reason for this was, and still is, simple. The subtle difficulties of expressing affection in Japanese society drive the drama, the humor and the plot in Masayuki Suo’s original – all important nuances that would be lost in a Hollywood remake. The versatile veteran Koji Yakusho plays Shohei Sugiyama, a painfully-reserved accountant seemingly resigned to an existence of routine and ennui until he happens to peer outside his train window and see a forlorn ballroom dancer, played by professional ballet dancer Tamiyo Kusakari in her debut role, staring out the window of her upper-floor dance studio. So begins Shohei’s curiosity and ultimate pursuit of competitive ballroom dancing. This pursuit results in a multitude of misunderstandings from his colleagues and family, and the fear that he would be caught partaking in such an uncharacteristic hobby. 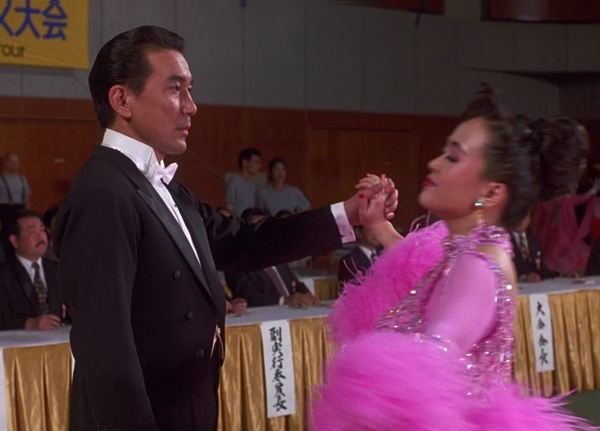 He makes friends along the way – including the dance-obsessed co-worker played by Naoto Takenaka in memorable, scene-stealing fashion – and learns a lot about himself. Suo hits all the right notes in “Shall We Dance?”, injecting just the appropriate amount of tension or comedy in various scenes without ever venturing into melodrama, yet at the same time gradually nudging viewers to care about his characters’ respective personal developments. It is a warm-hearted comedy that has stood the test of time, and Yakusho in particular masters the role of a conflicted salaryman. “Shall We Dance?” screens at the Japan Society at 1 p.m. on Sat., July 21, as part of the 2012 Japan Cuts program in New York.